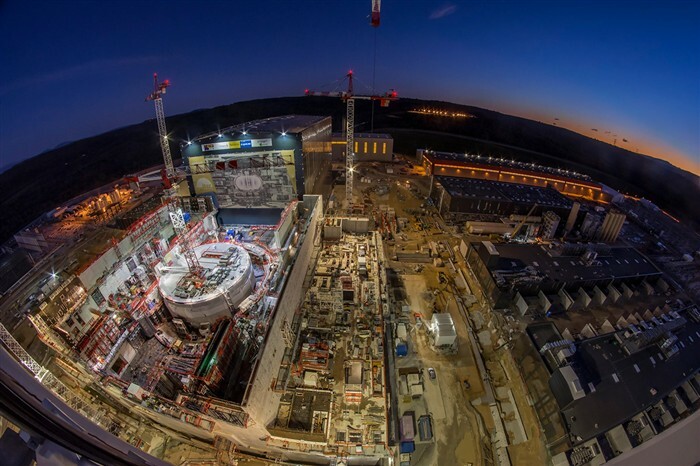 ​A workforce of 1 900 people is working round the clock to conclude the works of the biggest fusion experiment. The walls and floors of the emblematic building which will house the "heart" of the ITER device have come a long way. We stand a few metres away from the Tokamak complex to take stock of the progress. It's hard to concentrate because there is a lot happening: cranes are lifting steel bars, more concrete is being poured, workers wearing their white hardhats are continuously on the move, loaders are moving materials, pipes are inserted in galleries. There are definitely more buildings and facilities ready and the pieces of this construction puzzle are falling into place. Similarly, the manufacturing of components on-site is taking off. More tooling is being assembled in the Assembly Hall, the works are advancing in the Cryostat workshop, the Cryoplant, and the fabrication of magnets is accelerating in the Poloidal Coils factory. It's a site in fast motion. The lid covering the fully-completed bioshield, Tokamak building, ITER construction site, Cadrache, France. The works have been financed by F4E, responsible for the construction of the infrastructure and facilities on-site, and have been executed by its contractors. The ITER crown, a solid base ring and its 18 radial walls able to support the load of 23 000 t, has been completed. The works have been financed by F4E, responsible for the construction of the infrastructure and facilities on-site, and have been executed by its contractors. "In spite of the work organised in three shifts it still feels like a race against time. Then again, you have turning points in the construction roadmap which make you think we are on the right track. We have completed the concrete bioshield cylinder and the concrete crown where the device will rely on. We recently installed the feeder of ITER's fourth poloidal field coil – the first of a long list of components for this building. As works are progressing, we are handing over the buildings to ITER Organization to start of assembly of various plant systems," explains Romaric Darbour, Deputy Project Manager for Buildings, Infrastructure and Power Supplies. Towards the end of 2018, F4E delivered formally to ITER Organization the cooling water infrastructure. Workforces have almost completed painting the first floor of the Tokamak building, and the finishing works of the concrete crown will be concluded by the end of March. Meanwhile civil engineering works on its seventh floor (Level 5)) are advancing in full speed. On average, it is calculated that every 6 months another floor of the building will be completed to be handed over to ITER Organization in order to proceed with the assembly of systems. By September 2019 a significant part of the Tokamak building crane hall steel structure will be erected, fabricated, and pre-assembled. By March 2020 it will be completely erected. In the adjacent Diagnostics building, workers have started works on the sixth floor. Civil engineering and finishing works are ongoing in the Radio Frequency building so as to continue with the installation of equipment. The completion of the Magnets Power Conversion buildings in February will signal another major delivery from Europe to all Parties.